Are you looking for that investment which can offer higher return than your Fixed Deposits? Are you searching for a better investment avenue to invest lump sum money for your short-term financial goals? Then, Monthly Income Plans (MIPs) offered by Mutual Funds can be one of the best investment options for you. MIPs can provide better returns than Bank Deposits / Post office Savings Schemes, but you should be willing to take slightly higher risk. MIPs are suitable for risk-averse investors who do not want to take high risk (or) who do not want to invest in Equities or Equity oriented products, but can afford to take low or medium risk. What are Monthly Income Plans (MIPs) ? Monthly Income Plans (MIPs) are primarily ‘Debt oriented schemes’. These funds invest in a mix of equity and debt in the proportions of 20:80 or 30:70 or other proportions of similar kind. The objective of these funds is to provide enhanced regular returns to risk-averse investors by taking small positions in equity assets. The major chunk (70 to 100%) of fund corpus is invested in interest yielding Debt instruments like ‘commercial paper, certificate of deposits, government securities, bonds, treasury bills etc., The remaining portion ( 0 to 30%) of the fund corpus is invested in Equity securities (stocks / shares). The debt portion ensures stability, safety and consistency, while the equity instruments in the portfolio boost the returns. MIPs are market-linked products (to the extent of their equity portfolio). Generally MIPs fall under Hybrid – Debt category of mutual funds. Depending on the percentage of equity exposure that MIPs take, they can further be classified into MIP Aggressive or MIP Conservative Plans. MIPs which invest in equity securities in the range of 15% to 30% can be treated as “MIP Aggressive Plans” (Hybrid – Debt oriented aggressive schemes). These MIPs may offer slightly higher returns when compared to “MIP Conservative schemes”. But, do note that the improved returns come at a higher risk. Do Monthly Income Plans provide regular income? MIPs aim to provide investors with regular pay-outs (through dividends). But, it is not mandatory for the mutual fund MIP scheme to provide regular income, as dividends are paid at the discretion of the fund house and subject to availability of distributable surplus. MIP Dividend Option (Income option) – MIPs with dividend option provides you an income in the form of dividends. The dividends received by the investor are tax-free. The mutual fund company deducts DDT (Dividend Distribution Tax) at the rate of around 28.8% and then pays you the net dividend amount. To receive dividend income, you have to opt for Monthly Pay-out or Dividend Pay-out option. Kindly note that the quantum of dividends may not be fixed. MIP Growth Option – If you select ‘growth’ option, you will not receive any payments (dividends). You will get your returns only on selling the units. Since the fund does not pay out any dividends the NAV is much higher than that of the dividend option for the same fund or scheme. If you do not want regular income then you may opt for ‘growth’ option. SBI Magnum MIP Fund : This fund has allocated around 13.6% of its corpus to Equities and around 83% of the Fund’s corpus has been invested in Debt-oriented securities. SBI MIP fund has ‘average’ risk grade and ‘above average’ return grade. This fund’s ‘Direct Plan‘ scheme has generated around 14% in the last one year. Regular scheme has given 12.67% return. Birla Sunlife MIP II Savings 5 Fund – This fund has around 9% exposure to equities (stocks). Though this fund has lower exposure to Equity than SBI MIP fund, it has been generating similar returns. The expense ratio is reasonable when compared to other MIP conservative funds. This fund also has ‘below average’ risk grade and ‘average’ return grade. SBI Magnum MIP Floater Fund – This fund has around 13% exposure to equity securities, 25% in Debt securities and around 61% in Money market instruments. It has generated returns of around 11.41% in the last five years. But fund has high expense ratio. This fund has ‘low risk’ grade and ‘average’ return grade (as per valueresearchonline.com). ICICI Pru MIP Scheme – It has around 13% exposure to equity and the remaining portion of the fund corpus has been invested in debt securities (84%) & 3% as cash. This fund has ‘ above average’ risk grade and ‘average’ return grade. 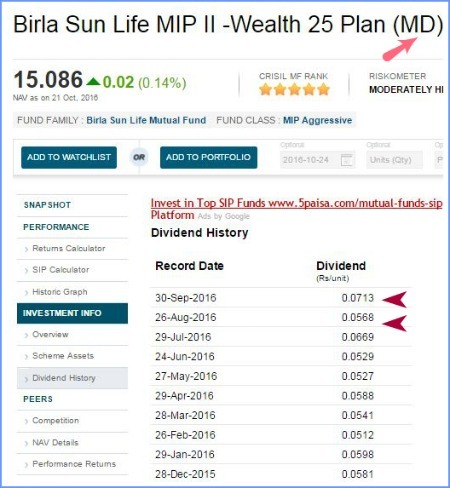 Birla Sunlife MIP II Wealth 25 Plan – This fund has around 30% equity exposure and is the main reason for fund’s out-performance. If your investment horizon is around 2 to 4 years, you may consider investing in this fund. This fund has ‘below average’ risk grade and ‘above average’ return grade. The direct scheme of this fund has generated return of around 17.48% in the last one year (regular scheme has generated 16.24% returns). Latest update (28-March-2017) : As per a notification by Birla AMC, the Asset allocation and investment pattern of this fund has been modified and this is with effect from 12-April-2017. The fund now can invest up to 10% (max) in Units issued by REITs. So, up to 40% (30% in Equities + 10% in units of REITs) can be allocated to Medium to High risk Securities. So, it is advisable to invest in this fund with a medium to long-term view. ICICI Prudential MIP 25 Plan has 23.6% exposure to equity and around 73% of the fund’s corpus has been invest in Debt securities. Kindly note that this fund has ‘high’ risk grade and ‘high’ return grade. HDFC MIP LTP : This has 24.6% exposure to equity and around 73% of the fund’s corpus has been invested in Debt securities. Kindly note that this fund has ‘average’ risk grade and ‘average’ return grade. Kotak MIP Regular Plan : This fund has allocated around 20% of its corpus to Equities and around 70% of the Fund’s corpus has been invested in Debt-oriented securities. UTI MIS Advantage Plan : This has 24% exposure to equity, 30% to Debt securities and around 36% of the fund’s corpus has been invest in Money Market securities. This fund has ‘average’ risk grade and ‘ above average’ return grade. Franklin MIP Fund : This fund has allocated around 19.6% of its corpus to Equities and around 70% of the Fund’s corpus has been invested in Debt-oriented securities. Lump sum Investment for accumulation : Let’s say your investment objective is to make one-time investment with a 2 to 4 year time-horizon, but would like to have less exposure to Equity, then investing in an aggressive MIP fund with Growth option can be a better choice. Dividend Income plan can give you periodic income. But, the fund may or may not declare it and moreover the quantum of payment can vary (as indicated in the below image). Though the Dividend income received by you is tax-free, the fund house deducts DDT (Dividend Distribution Tax) of around 28% and then pays you the dividend. So, if you are in 10% or 20% tax bracket, opting for a MIP-Dividend payout plan is not a tax-efficient choice. Whether you are in 10 or 30% tax bracket, MIP Fund with Growth & SWP option can be considered if your withdrawals are for more than 3 years, because the Long term capital gains are taxed at 10% or 20% (with indexation benefit). The total tax liability will be less than the dividend distribution tax charged in the case of dividend option. This can increase your return on the investment. In SWP option, you can decide the frequency and quantum of payout. But kindly note that if your withdrawal amount is more than the capital appreciation then the payout is made from your Principal amount. Mutual Fund MIP Schemes are treated as Debt oriented schemes (non-equity funds). So, the Long Term Capital Gains (LTCG) taxes are applicable on the units which are held for 3 years or more. Short Term Capital Gains (STCG) taxes are applicable on the units which are held for less than 3 years. STCG tax rate on MIPs is as per the investor’s income tax bracket and LTCG tax rate is at 20% (with indexation). If you opt for dividend option then any dividend income received from Monthly Income Plans is tax-free in the hands of investors. The performance of MIPs is greatly affected by interest rates in the economy (as majority of the fund’s corpus is invested in fixed income securities). So, MIPs tend to perform well when the interest rates fall (when there is a downward trend in the interest rate cycle). You can observe that MIPs (as listed in the above TOP MIPs tables) have performed well in the last one year or so, as RBI started to cut interest rates again. I believe that MIP schemes may continue to perform well in the next couple of years too. If you have a lump sum amount which needs to be invested for say 1 to 3 years then MIPs can be a better alternative to bank fixed deposits. You can also create SIPs (Systematic Investment Plans) in MIPs to realize your short-term goals. MIPs can be a decent bet if you are looking for regular income. Do watch out for ‘Exit Loads’, as most of the MIP Schemes charge an exit load of around 1% if you redeem the units in less than one year of holding. I believe that the ideal investment horizon in MIPs can be around 2 to 4 years. You may consider investing in Direct Plans of MF MIPs to get slightly better returns than Regular plans. There are few other alternatives to MF MIPs like Arbitrage funds, Fixed Maturity Plans (FMPs), Post office Monthly Income Plan etc., But, I believe that Mutual Fund Monthly Income Plans can be a better option for a conservative investor who is looking for better returns by taking limited exposure to stock market. Monthly Income Plans schemes offered by mutual funds are definitely worth considering. Best Lump sum investment options for Retirees / Senior Citizens | Best Saving options to invest Retiral benefits’. May I know your investment objective(s) and time-horizon for this?? Nice Post shared! Thanks for sharing it. Dear Kumar ..If you can afford to take risk, balanced fund can be an ideal choice for a 5 year horizon..
Hi Sree, Good morning ! Are these investments in MF for short term, 1.5 year? Your long portfolio is ok.
For short term, suggest you to put in RD or Short term debt fund (if you are ok to take risk). when i look at other funds for 1 year returns i could see huge returns… should i not invest in those? These are equity oriented funds and can be a very high risk investment if your time-frame is short term. Kindly note that the past performance may or may not be repeated in future (say next 1 year). First you deserve a big thanks for replying to each and every query. I am seeking an advise from you. After investing on my SIPs(12K : Equity LC-4K, MC-2*2K, Balaced4K, ) and PPF(2K) I can save upto 85K/month. I am thinking to save 25k in saving acc each month. I already have emergency fund FD. Now I am looking for good options to invest rest of the 50-60K monthly. One thought was to create FD for 30-30days and after few month when it becomes 3-4L, invest in some MIPs and repeat this cycle OR Instead of FD I can invest in short debt or arbitrate fund, may be 10k for 5 funds every month OR I should take 1 or 2 more SIPs worth 10K and invest 40K in FD or Debt fund. I am confused in this point. Please advise so that I won’t regret on my decision. If you are already maintaining sufficient emergency fund corpus, why would you like to invest in FDs for short term? Doing FD for short term was to convert it into big amount. For example 1st month fd for 1L, 2nd month 1L +1L of last month, 3rd month 1L + 2L of last month. So after few months I can have good amout that I can spend in MIP fund as lumpsum. So my question was is it right way to invest your monthly saved amount or I should break it and invest in bebt short fund or liquid funds? Dear Chandra ..Instead of investing lump sum, may be it is not wise enough to make the same installments in MF schemes? Yeah that’s where I needed your advice. As I mentioned in my first comment, I was thinking to start investing in debt ultra short fund or liquid fund or MIP around 50K per month. I am already investing 16K in equity funds for long term(8-10yrs). I have a short term goal of 5L in 24 months. So would you suggest investing in short or ultra short debt fund? or in any other MF? You may pick Short term debt fund, Arbitrage Fund, and conservative MIP Fund. Thanks Sreekanth. Last question I want to ask is, do I need more SIPs? I already running 4 SIP (All Equity for long term goal.) Should I start 3 more funds (Short term debt fund, Arbitrage Fund, and conservative MIP Fund) for short team(24) goal? Dear Chandra ..Each of these funds fall under different categories, you may pick any of them or all of them after going through their features & risk profile. It is not a must to have 3 funds from these 3 fund categories..
My father aged 76 wants to invest 10 lakh rupees for some monthly income. He is looking at maintaining the investment for 5-10 years, and needs return more than 8%. He is ok to take a little bit of risk. What are his options, and which option would you recommend? I am looking for an alternative to FD. As we know the FD rates are around 7%. Can you please advise MFs and category of MFs with moderate risk and can return 10 to 12%? Dear Raghavendra ..May I know your investment time-frame? At the outset, I appreciate your selfless endeavour of advising. I am a retired PSU executive with no pension scheme and hence depend on the generation of interest/STCG on my FDs with corporates & MFs for my monthly expenses. 1. My previous FD with a corporate house with average 11% interest is coming to an end. The revised interest being offered by them is 8.6%. I would like to invest this lump-sum into a hybrid Aggressive Debt Fund and create a SWP. Which Fund is likely to give average more than 1% monthly gain ? 2. I have heavy investments in SBI’s Pharma & Global Funds. They are both doing badly since I invested in them in Oct`15. Your suggestions for a switch over ? 1 – Are you referring to monthly dividend payout or Capital appreciation? 2 – May I know your investment objective for these investments? and timeframe ?? Currently, I am holding NRI status and want invest 2 Cr to get best monthly income in india. Can you please help me out. I saw many FD is also having monthly payout scheme but seems interest rate is lower than 7% or lower. Appreciated for your prompt reply. Are you looking at fixed and regular payout? Are you totally dependent on the income generated on this corpus? For how long (years) would you like to receive this income? May I know your expectation on quantum of income? My emergency fund (Rs. 100000) is just laying down in my saving account from quite some time. But I think it should be invested in some liquid fund etc. to get better returns and liquidity at the same time. You may consider mix of some of these options : Cash + Saving a/c balance + Liquid fund / Arbitrage Fund + FD. May i know, for how long you would like to receive this periodic income? Are you planning to take up a job in India? Do you have adequate life (self) & health insurance cover (for self& family)? Considering your profile, you may consider Fixed deposits only as the safest option (but do note that interest rates are low now). Post office MIS Scheme (max investment allowed is Rs 4.5 lakh), you can get fixed monthly income , lockin period is 6 years. Any Secured Non-cumulative NCDs for 2 to 3 years. Kindly read : List of best investment options! sir i want to invest my 2 lacs rupees for long term in any scheme so please guide me where to invest so i get better investment returns. I am looking forward to invest in schemes that help me generate monthly income. May I know if you are totally dependent on this income? Or Do you have other sources of income? Kindly read: List of investment options. I am retired person and want to invest some retired benifits in MFs. Kindly suggest me the portfolio of rs. 10 lacs investment. Kindly also let me know about Direct plan, growth plan , Dividend layout and dividend frequency etc. Terminology. Whether direct investment with fund company is better or through broker or distributors.. I am entirely new investor. May I know your objective to invest in mutual funds? Would you like to receive periodic income or is it for accumulation? MF Utility online platform for direct plans. I am in late 20s and a 1st time investor in mutual funds. I planning to invest in Franklin templeton small company fund through SIP. I would be starting with 8000 per month of SIP. This SIP is for long term plan of may be 2-3 years. Apart from that, I am also looking to invest further 10,000 in monthly investment plan, which provides a better return than bank FDs. Please suggest some monthly investment plans which can provide average/better returns than bank FD. Kindly note that 2 to 3 years can be termed as a short-term. Franklin smaller cos fund is a good one though, but remain invested for long-term (say 5+ years). May I know your time-frame for Rs 10k investments? I thought it is ok to put lumpsum amount in a MIP if I have 3+ years investment time frame. Based on this assumption I invested 400000 in BIRLASUNLIFE MIP II – WEALTH 25 PLAN on 5th Dec 2016. I just looked into my portfolio and this value is down by around 10300 rupees. I guess I was wrong in my assumption and I should make systematic investments in MIP schemes. I confused this with other debt/arbitrage kind of funds where I make lumpsum investments and they keep going up. Probably MIP needs to be treated like equity funds? Please advise if it ok to redeem these units once it gets even and start a new SIP? Most of the Debt funds got hit when RBI did not cut interest rates in its latest Monetary policy review. Kindly note that around 20 to 30% of fund’s portfolio gets invested in Equity stocks. And the share markets have been too volatile for the last couple of weeks. Personally, I too invest in the said fund. Thanks for your response Sreekanth. I understand the market is volatile at the down and kept going down post demonetisation. I want to stay invested in this fund for at least 3 years. My only concern is, whether I should start a new SIP to average out cost and redeem these units once market comes up? OR I should not make any change and lump sum investment is ok in MIP assuming 3 years investment time frame? You may invest additional investments in this fund if you it meets your investment objectives. But lets not assume exceptional returns from Debt or hybrid oriented Funds over the next couple of years when compared to the returns they generated during previous 2 years. Yes sir, we do have rental income but it will be sufficient to meet half of our monthly expenses and we do need a sound investment which will give us regular income better than FDs, We have health insurance cover.Thanks. You may consider two products, i) Post office MIS scheme & ii) Systematic Withdrawal Plan in Mutual fund MIP (growth plan). Post office MIS : Maximum allowed investment in a joint account is Rs 9 Lakh. You can get around Rs 6,000 per month. Kindly read this article : Retirement goal planning ..
My husband 53 years will be returningg from gulf by 2018 , so after that we will be leading a retired life. Please suggest funds or schemes to save tax and to get regular income as we would like to invest a lumpsum of 20 lakhs. Thanks. Are you going to be totally dependent on the income generated by this corpus? Do you have any other sources of income? Do both of you have adequate health insurance cover? I am working in Dubai and back home my wife is struggling to maintain my funds after meeting all the expenses. I am 50 now. So far, i have Rs. 15,00,000/- savings in various forms. I want to have good returns for this amount to meet monthly (my family) expenses in India. Please provide me your valuable advise to which Mutual fund is good & safe / Bank FDs. I do not have any idea about these investments. If you want safe & regular income then mutual funds might not be the right avenue. My age is 45, I would like to invest 5 lacs for getting monthly income in future. At present, I do not need money. but after certain age I would like to get certain amount every month. Which monthly income plan is suitable. Dear Hiral..What would be the time-frame? Dear Sreekant,It’s me again Manikumar.I am here to ask you another recommendation . I am at age of 30years.Say next 15 years I would like to invest 1 lakh /year and would like to choose option MIP. 1.What is best recommended MIP for next 10-15 years ? Should I go for aggresive/conservative/Growth Option ? 2.What price I can invest as first installment say @ what NAV I can buy this MIP’s ? Dear SreeKanth, I would like to generate Monthly income (say regular income) for my parents (no other source of income ) around 10,000/ INR .I look for MIP/MIS scheme which can generate such income. Can you suggest a plan? What should be my investment ? May I know their ages? and for how long you would like to take this income? (time-frame). Dear sreekanth,parents age nearing to 55 & has no source of income . I say to invest lumpsum so that they get 10000 evermonth. You may consider depositing Rs 10 Lakh in Post office MIS Scheme, which can give monthly income of around Rs 6,000 for next 5 years. (MIS has 5 year lock-in period). Rate of Interest is 8%. There is an option to receive interest amount every 6 months. 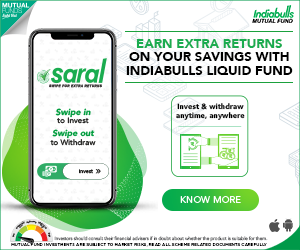 If you would like to withdraw the investment at short-notice and safety of capital is priority, you may consider Liquid debt funds. Hi Sreekanth, I want to make an investment on behalf of my Mom (57yrs) for 16Lacs. I want to invest in an MIS/MIP. Can you please suggest where to invest this with a low risk profile? May I know the investment objective (tax saving/regular income/accumulation) and time-frame? Is she going to be dependent on the income generated from this corpus? I am retired person, age 65 years . Still working as Consultant in infrastructure field. I am in 30% income tax slab. Should I keep my savings in Bank FD’s or in Birla MIP II Wealth 25 regular dividend. Dear Rakesh Ji.. If you want a fixed amount regularly, you may opt for MIP Fund with growth option and with SWP mode. Dear Devi..I have recently stopped offering one-to-one FP services. However, you may post your queries on Personal Finances at Forum section., will surely try to reply at the earliest. I have suggested to mother-in-law to invest in Birla Sunlife MIP II Savings 5 Fund ,around 2 L(age is 50 yrs),I can do it for her through online.But could you give rough idea how much she gets monthly through idea(I under stand MiP wont give stead& fixed income)? Dear Giribabu..Are you opting for SWP or Dividend payout option?? How much cash i have to invest in MIP to get a steady 10,000 monthly income? Dear Krishna..Kindly note that MIPs can give you periodic income but may not provide you steady & fixed income . Dear Srikanth. Thanks for your replies to all. I have just retired and have got a total 1crore as retirement benefits. I ll also receive Rs 35,000 as regular pension ( pretax). All medical expenses for me and my wife will be taken care by my Co. till last. I already have an income of 25000 PM as rent. I have opened Sr. Citizen account 0f 15 lac and MIP at post office of 13.5 lac . I have equity share of abt 5 lac mkt value I need pretax 70,000 PM for my expenses. 2. How much investment MIP with Growth & SWP ( Birla Sunlife MIPII & Wealth 25 plan), Aggressive or Conservative? Living Expenses (Rs 70k pm) : Rent (Rs 25k) + Pension (Rs 35k) + Quarterly interest from Sr.C.S.S can be around Rs 10k, which can be sufficient to meet your expenses. I believe that the maximum limit for PO MIS is Rs.4,50,000. If you have a joint account, then you can invest up to Rs.9,00,000. As your expenses can be met with the above investments/savings options and your health expenses are taken care of..May I know what is your priority? Is it accumulation of corpus by taking little bit of risk and investing in hybrid mutual funds with growth option? (OR) Would you like to look at taking withdrawals only? I THINK BSL MIP 2 WEALTH 25 FUND IS A GOOD OPTION. I am retired and 60 years of age. I would like to invest for a very long term in lumpsum amunt and get yearly return of 10-12% form my home expense. Also would like to know if the principal amount will grow when i get yearly returns. Please advice if the yearly returns will be taxed and which is the best mutual fund to invest my hard earned money. Are you completely dependent on the income generated by this investment? Do you have other sources of income? Do you have dependents/any financial obligations? Are you looking at only accumulation or accumulation + periodic income (withdrawals)? I want to invest for Mom. I can invest nearly 3 lac every year. I looking for MFs that can provide monthly returns (via dividends or systematic withdrawal) between 5k to 7k (for household expenses) with accumulation. Please guide. Dear Pankaj ..You may consider MIP fund with Growth option and SWP mode. But are you looking for withdrawal or accumulation? If I have a lumpsum to invest , say 3 lakhs (and time period is around 3 years) , could you pls let know which is the best option . a) Put the lumpsum in to Birla aggressive MIP fund (without timing the market though 30 percent equity is there ), and take the money after 3 years . b) Put the lumpsum on a liquid fund , and from that move it via a SIP to a balanced fund from that for 3 years .. Both are good strategies. So, it depends on your ability to take risk. (assuming you are referring to equity oriented balanced fund). I would like to invest in some scheme which gives a monthly income of about 20,000 to be given to my retired parents who already earn 28,000 as monthly pension+12,000 as interest from various FDs and senior citizens saving scheme. My investment appetite is moderate to aggressive . Dear ajit ..You may consider investing a lump sum amount in aggressive MIP with Growth & SWP option. For ex – A Rs 10 Lakh one time investment can give roughly Rs 2.35 Lakh per annum payment assuming the return as 9% (subject to taxes). I am assuming the returns on a conservative side. DEAR sir, in some bank give more interest ON R D & F D just like Bandhan bank 8.25 and also get .50 extra for senior citizen YOU don’t think this is is a good & safe idea . Dear MOHAN ..It depends on ones investment objective(s) & financial goals. I am 43 year old. Would like to invest 10 lacs in Debt/MIP/Balanced fund for 3+ years primarily to to gain good returns and pay 20% tax post indexation ( if debt) or Nil if it is balanced/MIP. I am ok to take moderate risk if returns are higher. I am not looking for equity oriented fund as of now. Can you suggest 3-4 funds from the above three categories , please? 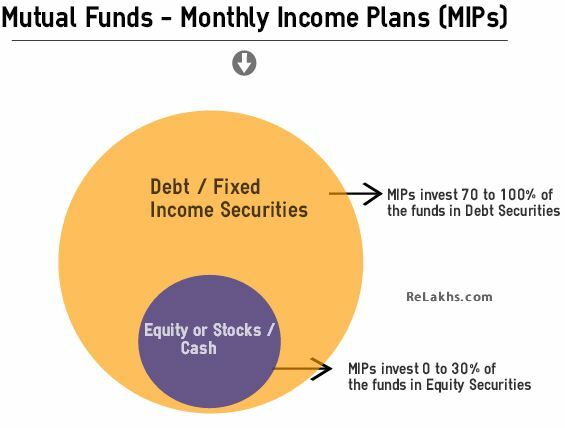 MIPs are treated as Debt oriented funds, so tax is payable on gains (if any). You may consider – Short term debt fund, Dynamic bond fund, Arbitrage fund & Aggressive MIP (ex- Birla Wealth 25 MIP II plan). Thanks for your guidance man. Sorry for my very silly question. As i am a very new invester in MFs. I want to know about the security of money. Like is it safe as FDs? I am not talking about loss or profit, I’m asking about any fraud or anything else. Are Direct or regular plans equally safe? MF industry is a very well regulated one. Primarily the risks are associated with the investments and may not be related to frauds. Another risk can be you may be mis-guided by the intermediaries. Direct plans or Regular plans have same portfolio, so the inherent risk is same. But you can get slightly higher returns from Direct plans. Are Bank FDs totally safe? Thanks Sreekanth. One more thing, Is it a good idea to buy “MIP Aggressive Plan” and “MIP Conservative plan” with same fund house. Ex. Or should i go for two different fund houses plans? Dear Rahul ..May be nothing wrong in going ahead with same AMC, portfolios can be different. Why does MIPs do well in a falling interest rate cycle, if they are invested in govt securities – as the fixed income / bank deposits rate comes down, it is expected to result in falling interests for other fixed income securities / govt securities too , right ? MIPs primarily invest in Debt or fixed income securities or Bonds. The prices of Fixed income securities are inversely related to prevailing interest rates. For example, consider a 10 year government bond which has a face value of 1000 a coupon rate of 8% i.e. one receives an interest payment of 80. If the lending rate has been increased to 10%, the new bonds with the same face value of 1000 and tenure of 10 years provide a coupon rate of 10%. This makes the existing bonds at 8% coupon rate less attractive and it will be traded below its face value in the market. Let us assume that the existing bond is now being traded at 900. The yield of the bond is increased to 8.89% (80/900 *100) from the initial 8%. Similarly, if the interest rates are slashed to 7%, the existing bonds at 8% coupon rate attract more buyers. Now the bond trades at price higher than its face value. If the bond the trades at 1050, the yield on the bond will be 7.62% which is lower compared to the initial rate of 8%. The yield of the bond maintains a direct relation with interest rate and the price of the bonds maintain an inverse relation. A drop in interest rates will create more demand for existing bonds in the secondary market and increases the bond price. Similarly, when the interest rates increase, the existing bonds are traded below their face value. Thanks once again, Sree ! Please let us know the difference between Liquid debt mutual fund and Monthly Income Plans (MIPs) of Mutual Fund Schemes – Dividend option. Monthly income – name is confusing. If I choose monthly income plan, is it that we get some amount monthly? I dont want monthly amount now (as I am salaried), want to invest in debt products. Also want to invest in short term product, as I have money which I need for construction of house in few months. Suggest you to go through this article – Types of Debt funds. In any Mutual fund scheme there will be options like Dividend & Growth. Growth is for accumulation and dividend can be chose if you would like to recieve dividend income. MIP – Dividend Payout or Monthly Dividend option is to get periodic income. In case if you would not like to receive the dividend you can opt for Growth plan. Offlate i am trying to identify best fund whereby i can get suitable returns monthly,can you please suggest which fund would be good for me to invest and get good monthly returns,and the suitable amount to invest in. Dear Mohammed ..Amount? – It depends on your investment corpus and requirement. You may consider opting for SWP (Systematic Withdrawal plan) under Growth option of any of the above funds. Thanks for your reply,as about the amount I am considering to invest around 5 lakhs. Suggest you to read one of our Forum Questions on the same topic..click here.. In case if you need more info, do revert to me. I am interested in Monthly Dividend paying mutual fund. Kindly suggest me the best fund to invest with consistent and regular payout. Dear Aniruddha..Suggest you to visit moneycontrol.com, search for shortlisted MIPs with Monthly dividend (MD) or Dividend payout Scheme names, click on ‘Dividend history’ link which is available on the left hand side. For example, visit this link..click here.. I am 65 and has interest income of 1000000 which attract 20% tax. How can I reduce my tax by investing in mutual fund. The long term capital gians on equity mutual funds are NIL. Retruns from Arbitrage fund (which can give you around 8% returns) are tax-free if the units are held for more than 12 months. Also, debt funds can give your better tax adjusted returns than FDs/RDs. But kindly plan your investments as per your investment objective & time-frame and not just based on Taxes alone. MANY THANKS FOR YOUR ARTICLE. NOW I HAVE A QUESTION TO YOU. I MADE SOME SIPS IN MARCH 2015 IN THE FOLLOWING MID & SMALL CAP FUNDS. NOW SHOULD I REDEEM IT? BECAUSE THE VALUE HAS BEEN APPRECIATED AND AFTERWARDS THE NAV MAY GO DOWN AT ANY TIME. PL. ADVICE ME. Dear KAUSHIKI ..We invest in mutual funds for long-term and if the investment is appreciating then well and good. If your goal(s) years are not in near-future, you may continue with your investments. many thanks for your analysis. i made the following 2 policies. 1. LIC WEALTH + in feb. 2010 by investing 60,000. the present value is 71,000. now should i surrender the policy or hold it, as i came to know from the websites that LIC will go for a IPO very soon. 2. on oct. 2008 i made a policy in BSL FREEDOM 58. the total premium paid for 5 yrs. is 1,20,000. now should i surrender the policy at present NAV? pl. guide me. because your suggestion is very valuable to me. dear sir, many thanks for analysis. but in BANK FD compound int. is calculated. so how a MIP is better than a FD? Dear KAUSHIKI ..Bank FD gives fixed return. Whereas, returns on MIP are not guarenteed, but can give better returns as a small portion of the fund corpus is invested in equities (shares). The risk profile of both these products are different. Also, TDS is applicable on FD interest income, whereas the gains on MIP are taxed only on redemption. dear sir, many thanks for your early reply. if anybody wants to invest a lump sum amt. of money in a debt fund for STP which of the following is the best? 1. FROM DEBT FUND : ICICI PRUDENTIAL LONG TERM FUND TO EQ. FUND : ICICI PRUDENTIAL TECH FUND. 2. FROM DEBT FUND : HDFC HIGH INT. FUND TO EQ. FUND : HDFC EQ. FUND . Dear KAUSHIKI ..May I know the investment horizon? Is it HDFC High interest dynamic or short term fund? Also, we can not compare Tech fund to a pure Equity fund. dear sir, many thanks for your early reply. the time is 2 years. which one is better option? HDFC High interest dynamic or short term fund? because different opinions are available in websites & in lieu of ICICI TECH FUND i am interested in VALUE DISCOVERY FUND. as i was a professional teacher once upon a time i am very much impressed with your analysis & simple explanation. thanks again and enjoy yourself. If your investment horizon is 2 years, kindly do not invest in Equity oriented funds. You can redeem NCDs on stock exchanges. But kindly be aware of the tax implications. dear sir, many thanks for your early reply. now again i am disturbing you. i made a bank fd on 2.9.16 for rs. 48263 and suddenly i need the amt. immediately. now what should i do? should i take a loan against it or make premature withdrawal? i can take max. 40 k loan. sir, pl. explain me the way of cal. as in future also i need loans. i made the calculation on the following way. am i correct? int. on 48263 @ 6.8% (as 1% penalty) for 20 days (i.e. from 2.9-21.9) is 180.
int. on 48263 @ 7.8% (as normal rate) for 20 days (i.e. from 2.9-21.9) is 206.
if i have taken a loan against it i have to pay 48224 at maturity and the net receivable amt. would be 7862 (56086-48224). Dear KAUSHIKI ..If I am in your position, I will just make a pre-mature withdrawal and use it.Let’s keep it simple. if I have a corpus of 70 lakhs as my life savings & I need a monthly income from it to live my life with family, what would be the safest yet best instrument(s) to park my money in? kindly give me a detailed guide as to how should I go abt it. May I know your age? Is the family covered with health insurance? I am 41. Yes I have Apollo munich family floater-Optima restore for 3.5 lakhs. Kindly use the calculator available in the below article, to know if this corpus is sufficient to meet your living expenses for the rest of your life. Read: Retirement goal planning & calculator. Dear Nishanth ..Yes, they do give monthly dividends (if declared). Suggest you to visit moneycontrol.com, search for shortlisted MIPs with Monthly dividend (MD) or Dividend payout Scheme names, click on ‘Dividend history’ link which is available on the left hand side. I have read many regular income plan details but there is not one suggestion about HDFC Prudence Fund that is giving a regular return of 1% per month on investment. Any reason why no one is talking about it? Most of the so called advisors’ advice depends on the commission rates. This article talks about MIPs. I think one of the most important aspect of an MIP should be consistency of divided payments. Check the performance of suggested schemes in the last five years. You will know the “value” of the article. Once again, HFDC MF MIP LT is the ignored scheme. HDFC Prudence fund is an equity oriented plan and a decent fund in its category. Kindly note that here we are discussing MIP plans. How much money i will get monthly approximately if i invest rs 10 lakhs in MIP? I can take risk. also suggest good MIP fund. What are the tax implication? Dear pradip .. If you look at the dividend history of Birla MIP II Wealth 25 plan, the fund has paid on an Avg Rs 0.055 per unit as dividend per month. Invest in HDFC Prudence fund. Further since it has 35% debt, it’s classified as “equity fund”. This means LTCG tax is zero. Moreover, LT is 365 days. This is not the case with MIPs. Dear Milind..Let’s not compare an MIP scheme with an Equity oriented Balanced fund. Thanks for the wonderful blog, financial market has become kind of maze puzzles, that your kind of minds can solve. Please help me resolve one puzzle I have. If I invest in one MIP fund 50 lacs right now in Aug 2016. The fund is giving 10% average return since last 3 years. For example if we consider any best performing MF/MIP from HDFC/SBI or Franklin..
* Since which Month I would be able to receive my Monthly Income? * Will they deposit to my NRI account and I can use it in my foreign lands? * What would be amount on 50 lacs if the returns as they claim are 10% every year, considering the govt taxes, exit fee or any admin fee also MIP-MF company have. I want to compare it with investment in real estate and rental income as with the option I have for investment in real estate. I want to compare based on above figures as per answers you provide…. Many thanks for your time and help!!! please assume if any more data is needed. If you would like to get monthly / periodic income them you have to opt for Dividend payout option. Kindly note that though the name is mip but monthly dividend payouts may or may not happen and also the quantum of payout can vary. That means if I need to draw monthly amount I need to sell some holding. Can I transfer that money to NRI account, is there any deductions? What will be other deductions from the fund house or taxes for my monthly deduction, lets say if I decide to withdraw every month 40000 Rs. 3 – As opined by you, manually redeeming the units. Kindly read: MF taxation rules. The fund house’s service charges are generally how much? This charges on the total investment we makde, ie for example 2% service charge on the total invested monry? Dear Sherani ..Are you referring to Entry load? No Entry load charges applicable on mutual fund schemes. Yes on Mutual funds, actually I wanted to know if I get return on Mutual Fund as 10% lest say as amount we get 10000 Rs as return on Investment in Mutual fund, what deductions will be done on this apart from Taxes, any service charges from the fund house that generally is 1% to 2% on investment? Dear Sherani..Exit loads can be applicable but in most of the cases it is NIL after certain period of holding (like 1 year in case of equity funds). < 2 year : You can consider Arbitrage fund + Dynamic Bond fund / MIP conservative fund. 3 year goal : You can consider MIP aggressive fund. Read: Best Arbitrage Funds. I appreciate your hard work and for such informative article. My wife and I have two different saving accounts and each a/c having R.350000 and Rs.300000 respectively. What do you suggest to keep this money in saving accounts? or Transfer it to our PPF account(we both have made saving of Rs.150000 for each of us) or Invest Lump Sum in MIP or start STP? But I’m not sure how to start STP and which MF ‘s are best for investment.Could you please suggest the best investment option or best STP funds?My investment plan is for 3 to 5 years. Or there is better option for lump sum investment in MF’s . Do you require this money after 3 years? May I know your investment objective? This is surplus money I don’t require it after 3 years. I guess we will enough money after 4 years for my kids education as we both husband and wife can earn Rs.14 Lac per year. And I have deiced to start SIP in the following funds of Rs.400000 PM. All the funds are good ones. But investing in mutliple funds especially from the same fund category may not be beneficial. You may trim down your portfolio. Thanks for reply. I have reseached give links and I will definitely trim off my portfolio and avoid portfolio overlapping. But, my first question is still unanswered! My wife and I have two different saving accounts and each a/c having R.350000 and Rs.300000 respectively. What do you suggest to keep this money in saving accounts? or Transfer it to our PPF account(we both have made saving of Rs.150000 for each of us) or Invest Lump Sum in MIP or start STP? But I’m not sure how to start STP and which MF ‘s are best for investment.Could you please suggest the best investment option or best STP funds?My investment plan is for 3 to 5 years. Or there is better option for lump sum investment in MF’s .This is surplus money I don’t require it even after 7 years. You may set up STP from liquid fund to Balanced fund. ex – HDFC Liquid fund to HDFC balanced fund. I am scientist by profession and of age 33. I have no clue about financing and would like to invest for near future (3-5 years). I have huge liabilities and can hardly make savings. I would like to have your opinion about which investment plan/s will best suit me. I am looking for monthly investment, which will be easy for me. Moreover, if this monthly investment is flexible in increasing the amount whenever I find suitable, will be better. I do not need a monthly income. If you have high cost loans, you may try clearing those first on a high priority basis. You may consider creating a SIP (Systematic Investment Plan) in Aggressive MIP fund and in one Balanced fund. Ex – Birla Sulife MIP II Wealth 25 plan & HDFC Balanced fund. I wish to invest in MiP mutual funds for long term.kindly advice on the average post tax returns of MIP vis a vis secured ncds offering montly option. I am 50 years old.and am well invested in all other assets. NCDs can give your fixed return where as MIPs returns are not fixed. Interest income on NCDs is taxable. MIP funds invest certain portion of fund corpus in equities (can be 5 to 15%, allocation). Do you require dividend income (periodic income) or are you looking at returns? IF you are in highest tax bracket, may be MIPs can be a better choice. Also read : NCDs – review. Please advice on the MIP returns post tax. Dear hitesh ..Returns can vary year or year and they are not guaranteed. You may have a look at the past performance table provided in the article. The post is extremely helpful. If you could also spare some time to write a few lines of suggestion for me, I will be obliged. Other than the ELSS and a few FDs, nothing will give me a lumpsum in 3-4 years span. Do you think the above is not a good plan and should I change it ? What else would you suggest ? Is investing in ultra-short and gilt funds a good plan considering 2016-2020 financial cycle ? Or do you think the balance is not even. In addition to above, I am planning to invest either in 5k per month SIP in anything which is good OR a lumpsum in ultrashort fund..
2 – Is it a life insurance plan? Interest rate cycle is in downward trend. So, investing in Short-term debt or dynamic debt funds can be good. But do note that they may or may not give the kind of returns they have given in the last 2 years or so. You can consider one balance fund (for next 2 years) + MIP fund for 3 years + Short-term debt fund. 2- It is a traditional guaranteed return plan , which also covers insurance during the policy tenure. I am investing 5k per month in PPF (I pay lumpsum of 60k at one go before 5th March every year) and this is the 4th year. Do you think the amount needs a reduction and a part should go to some short term investment ? I do agree only Me myself in the whole world should know in what ratio I should divide my investment, but could you still advice ? 2 – Suggest you to discontinue this traditional plan. Term insurance + PPF Vs traditional life insurance plans. To reduce your PPF allocation or not, depends on if you are falling short of your required corpus for your short-term goal. Read: The 6 most common personal finance mistakes..
Tax free bonds can be a better option. Though post office Sr.Citizen scheme / MIS are good, the interest income is taxable. MF MIPs dividend income is not taxable in the hands of investors but kindly note that income is not guaranteed and may not be periodical. So, you may have to slightly modify your investment objective or invest in a combination of few investment options. Kindly read: List of best investment options. I am presently having an investment of Rs.1.6 crores in equities. This figure is current value and the invested value is Rs.1.9 crores. I am a long term investor. I am now 70 years and wish to withdraw the total amount once the value appreciates and invest the total amount in MIP. Post Office and Senior Citizen Saving Schemes are already taken care of. Request you to kindly indicate to my e-mail as I have to slowly switch over from equity to MF. I am 66 years old.Can you suggest some monthly income scheme which can yield higher returns at the same time appreciate in value but I want guarantee monthly income. As you have already stated in your site for guaranteed monthly income scheme suggest me tax free bond or Sr citizens post office which one is best to opt? In which scheme I will get more income if we talk about 10 lakh investment (for an instance forget about the year of investment) then what would you suggest. If you want guaranteed income then you may consider Post office MIS & Senior citizen schemes. A portion of your money can be invested in MIP MF schemes. this site has given me a new dimensions in monthly investment schemes. Thanks. I am a working personal interested in investing in a lump sum ,which I should get a monthly pay out as a tax free income. Presently I am investing in a 46 days FD which is only giving me 6.5% and payout is interested. I have seen PO MiS which gives 7.8% payout, but no principal bonus at maturity. Can u suggest me any other safe investments with more monthly returns than PO and tax free , with 0 zero exit load for 2years. Dear Vivek..I am afraid that no such plans are available. But do have a look at Arbitrage funds. May I know your age and the reason for looking out for guarenteed /periodical safe returns? (trying to understand your viewpoint). I am 29yrs old. I am just a beginner in finding a financial solutions for my investments. Actually I am interested in gaining some second source of monthly income , with investing some lump sum money. I tried Trading which I couldn’t succeed as from last year I am being doing official travel. Investment in 46 days FD was also good when that time it was 8.2% now it is 6.5% and getting taxed also. That’s y searching for a secure investment with tax free monthly income. Is there any option like that. Considering your age and profile, suggest you to start investing for long-term wealth accumulation instead of monthly income option (if you can afford to do so). Kindly consider investing in a Diversified equity & a balanced fund. You may consider other options like Senior Citizen Savings scheme (post office) or MIS Scheme (PO) if guaranteed and periodic payments are expected by you. The mutual fund company deducts DDT (Dividend Distribution Tax) at the rate of around 28% and then pays you the net dividend amount. Individual unit holder is not liable to pay this. I am looking for SWP from mutual funds with an investment horizon is five years… around ten to 12%.. Since an SWP is nothing but redemption of units from the scheme, the tax treatment of each withdrawal will be the same as in the case of full withdrawal of equity and debt funds. Hi, I have a few queries. As far as I have understood, MIP s are good short term investments. My mother is around 73 years of age. All she has is a few lacs of rupees & her expenses are met from its interest. If she buys MIP ( conservative plan ) jointly with some one and requests for auto renewal (for security reasons, which are personal) for as long as she lives, will this be considered as a mistake, because then it becomes a long term investment? MIPs can also be considered for long-term. But kindly note that income/dividends paid out by these schemes are not guaranteed and may/may not be periodical. You may also consider other options like : Post office MIS or Senior Citizen Savings Scheme. ICICI and Reliance have Nil exit load if redeemed after 1 year. But for Birla MiP 25 plan, it has to be invested for 1095 days. Why would one for go for Birla then. Are you please able to advise. I am laymen in finance space, I do not know anything about mutual funds, but i have a plan of investing Rs 3000 per month, Also i have a LIC policy(Jeevan Anand). Now I am thinking of investing in MF’s, But not to sure as to whom should i approch, Where to open a demat account, What will the broker charges? Please guide me on this. Kindly first identify your goals & time-frame. Read: How to create a solid investment plan? Term insurance plans Vs traditional plans like LIC jeevan anand. You can invest in direct mutual fund plans of MF schemes through MF Utility , no charges are involved. Kindly note that demat account is not mandatory to invest in MFs. I have around 6 lacs to invest. I am looking for a guaranteed monthly income plan. yes bank is suggesting me to invest in max life guaranteed monthly income plan. my horizon is 3 to 5 years and after that I wish to get a guaranteed return. what should be the best option for me ? Its better if you do not invest in the suggested life insurance plan if getting a risk cover is not your requirement. You may consider to invest in an Aggressive MIP-Growth plan for next 3 years or so and then create a SWP (Systematic Withdrawal plan) from this fund. But kindly note that the dividend payments are not guaranteed. If your objective is to get guaranteed returns and safety of capital is your priority then you may have to save the money in Bank FDs only. Nice article. Just want to share with you and other readers. About two years back, I had invested about Rs. 2 Lakhs in HDFC MF Monthly Income Plan – Long Term – Monthly Dividend. This MF gave good returns. I was getting around Rs.1100 monthly as dividend and when I exit the fund value was Rs. 2.2 Lakhs. If someone looking for monthly income plan, I feel this is the best MF. It gives Rs.0.08 dividend per unit each month. Dear Peerzade..Thanks for sharing your experience. Keep visiting! Hi. I want to invest Rs.5000/- to Rs,10K Kindly name some good organisations where I can invest. Dear Gopal..May I know your investment objective(s) & time-horizon?? Are you planning to invest in Shares or mutual fund schemes? First of all thank you for providing such insight into MIP. I have just started earning and fall under the 20% tax bracket. I have no Investment whatsoever, however I am planning to invest around Rs 5000/month for the next 2 years. Till date, I have not invested into anything be it LIC,Band FD’s etc. Is it that you require this amount after 2 years or you would like to just test the waters, and learn basics of mutual fund investing?? If you would like to take ‘moderate risk’, you may consider investing in a Balanced fund. Thanks for educating us on MIPs. I am looking for some regular monthly income. I have 4 lakhs rupees to invest. I want to invest in some monthly income plan and I want to invest the monthly return in some SIP/Balanced fund(or any other good scheme) that can get me good return. I also need the flexibility to withdraw the money during emergency. Please guide me. May I know your investment time-frame? Also, prioritize among – Periodic income, flexibility/liquidity & returns?? Thanks for your prompt reply. I am not very strict on the time frame. I am looking for some good monthly returns, which I can use for reinvestment or monthly expenses. Please advice me any time frame that can get me good monthly return as well as benefit in long run. I am in my thirties and ready to bear moderate risk. I want to make a onetime investment and would like to get the returns soon(better if form the very next month) after my investment. If you have to get benefit (compounding) in the long-run then you have to opt for ‘growth’ option and not periodic payment option (dividend). So, suggest you to invest a portion of your surplus amount in MIP fund with dividend/income option and the balance amount in one Balanced fund (growth) for long-term accumulation. You may also have a look at Arbitrage funds with dividend option. But kindly note that MIp/Arbitrate dividends are not guaranteed and they may or many not be periodic in nature. Thanks Sreekanth, for your suggestion. Could you please suggest me some MIPs scheme? Dear Tania..You may pick from the above list given in the article. I have total 2lakhs in my account that I want to invest in mutual fund. I want to invest this money at one time rather than SIP as I am doing some SIPs as well. Do you suggest choosing HDFC or TATA balanced fund (or any other fund then pls let me know) if I want to invest it for 5-8 years? My understanding is that if somebody want to do one time investment with low-moderate risk, then balanced fund are good, is it? Dear Prem..Kindly go ahead with your plans of investing in Balanced fund(s). First of all many thanks putting all your effort and time in helping alot of people, without even knowing them. Really appreciated. Now coming to my point. My family (me and my wife) are around 33 year old and each one fall in 20% tax slab after exemption from 80C and 80D. Together, we would like to invest 20K per month for mutual fund, some to save tax and some for long term. 1) 10K for ELSS to save tax for time horizon 5 years. For this purpose, I have choose two stocks on basis of your other blog. I want to do SIP for 5K on each. b) axix long term equity fund. Are these good investment considering my time horizon, if not then suggest any other, In worst case, I can still wait for 7 years. Which 3 stocks should we invest from your point of view. Many Thanks again for all the good work! 1 – Kindly note that the shortlisted ones are Mutual funds and are not Stocks. Kindly note that you have to plan your SIPs when it comes to ELSS as the units are locked for 3 years. So for example the units allotted in the 5th year (your investment horizon) will be locked for three more years. All the funds are good ones but suggest you to stick to any of the 2 funds. Read: MF portfolio overlap analysis tools. 2) You may drop UTI mid-cap fund & Birla fund. Thanks for all the detail info! Greeting for such a good and informative post. I am 35 year old and fall in 20% tax bracket but to save taxes I have to invest 1.5lkh per year. I have time horizon for 3-10 years, all i want is good return of my money that I am investing now. I have option of LIC, PPF, NSC, PPF and ELSS. a) If I have to invest 1.5 lakh per year what you will suggest? b) Which mutual funds you would suggest for ELSS? In both cases, I am ready to take low and moderate risk. May I know your existing portfolio of investments (if any)? a) If your investment horizon is say >5 years or so and one of your investment objectives is to save TAXES then investing in ELSS would be a better option. Do you contribute to EPF scheme (assuming you are a salaried person)? Do you have any existing life insurance policies? b) Kindly note that ELSS are equity oriented products and understand the risks associated with them. Read: Best ELSS Tax Saving Mutual Funds 2016. I have never done any kind of increment and now need to do one for already three years with a monthly investment of 2-3k. As per your article you mentioned the dividend plan attracts DDT during dividend payout every month. What about the growth plan? Is it tax free at the time of reclaiming i.e. after three years are complete and i am selling the units? Sorry if this had been answered before but i am still starting with this investments domain so i need some layment language answers to questions, if you dont mind. Suggest you to read this article : MF investments & Taxation rules. On the below query only, I have compared the NAV downloaded from Birla sun life’s website only and same cross checked on Value research online. Dear Nirmal..Kindly note that I have posted this article sometime back and the returns were based on the date ranges that were selected at that point of time. If you look at the returns now, obviously they won’t match. Was going through your above article and found very knowledgeable, thanks for the same. Just got a question. Correct me if I am wrong here: As per above table Birla Sun Life Monthly Income Plan II – Wealth 25 (Growth) has given 20.7 return. Is it in % term? If so then I don’t see the same for this fund over the last year or so. Also if not in % term then how the returns are calculated. This will be a very helpful for me to understand and take proper investment decision. My age is 27 year. I am a student preparing for competitive exams … from your articles and query section I learned a bit of Mutual fund MIP.. I also want to invest in MIP for 1-2 years so that I can get some monthly income ..kindly suggest me any plan that can give me monthly income ..
Kindly note that MIP-Dividend option can give your periodic income but do note that the returns are not guaranteed. If your priority is to get periodic and guaranteed returns then you may invest in other investment options. Read : List of investment options.. I am retired and in addition to safe bank and PO investments, planning to invest in MIP. My adviser says ICICI advantage balanced fund guarantees 0.75% monthly income (=9% per annum) on investments in this fund. In fact,the form also states so. My question is can MFs guarantee such regular income ? It is an Equity oriented fund Hybrid fund and hence the returns are not guaranteed. Thanks a lot for sharing such valuable information and knowledge. I am moderately new to investing in Stocks and MF’s. Recently I have invested in ELSS “Axis Long Term Equity Fund (G)” with an SIP of 4k for my 80C. To give you background, I can invest 7k per month and an investment horizon of 2yrs. I am ready to take the moderately high risk while picking up the MF’s where at least I should get minimum 10% returns annually. Let me know if you suggest any other funds apart from the above listed ones. Do note that ELSS fund units have a lock-in period of 3 years. I have just retired at 58 yrs. and hence not in Sr. Citizen category. I will be getting around Rs.30 lacs. Since the return in Bank FDs for general category is very low i.e. around 7.5% only can you please suggest some good mutual funds where my investment will be safe and also I can get around 10 to 12% return. Kindly let me know what is your investment horizon? If you would like to invest in equity oriented mutual funds then they are subject to investment risks. So, may I know your investment objectives? Is safety of capital your priority? Do you need any periodic income from these investments? Do you have any other source of income to meet your living expenses? I want to invest in Reliance MIP. would it be possible for you to give me details regarding the same. like if i want to invest 10000 monthly. what would roughly be my net returns? The returns are not guarenteed, as a minor portion of fund corpus is invested in equities. As given in the table, you may expect returns of around 10 to 12% in 3 years. I have a plan in icici prulife super pension plan of monthly Rs.1700 premium and it will mature on march 2017. My question is after 33% withdrwal ,balance amount had to invest in annuity of several 6 options. which option is best so that i / nominee will get back purchase price earlier for re invest in good mip plan? Do note that Annuity income is taxable. I wish to invest lump sum of Rs 30 lakh and get an assured minimum monthly of Rs 30k or more (after taxes). I am completely new to investing options.What are my options and how do I go on about it? Are these safe? Please give me all options possible giving me maximum monthly returns from my lump sum. Dear Shyamal..May I know your age & the Income tax slab that you are in? I am 68 years old and currently self employed, running a very small business. My income is approx 3 lakhs per annum.Please help. I am also in a similar situation like Mr Shamlal ,I also want to know while investing in MIP (conservative) debt Mutual funds ,Is our principle amount safe(like fixed deposite), I have understood that our return and monthly income depends on the market. I am also looking for a One time investment for about 3-5 years, see FD’s intrest rate has further fallen down to 7.30% as per today. In most of the scenarios, you may get positive returns from conservative MIP MFs, however your capital is not safe like in FDs. Sometimes (very rarely) debt funds or hybrid debt oriented funds do give negative returns. Kindly read : Why you should not invest in FDs for longer-periods. You can consider Post office Sr Citizen scheme, Post office MIS & Bank FDs if you require periodic and guaranteed income. The fact that the fund houses pay the DDT, for the dividend payout, are the returns of the Dividend option of Debt Fund less as compared to the Growth option of the same Debt Fund? Dear Atul..Kindly refer to out conversation on FB. My salary is 40 k , wish to start an SIP, Which one you suggest.It is for another 10 yrs. I can make 15k for the SIP. Which is the best ELSS for this year.Axis long term and Franklin tax shied.What you say?? For long-term horizon + tax saving purposes, both the funds are good. Franklin fund has good long track record. I want to invest 10 lacs on behalf of my parents ,so than they can get monthly income of Rs. 10 to 15 K.
Can you pls suggest me where to invest money for there retirement???? Do they need Rs 15k income starting from now? Or do they still have some Service Period left? My father has recently retired and I am looking to invest a lump sum amount on his behalf such that he can earn monthly income on ~15 – 20k per month for his regular expenses. I am looking for options beyond FDs to invest the surplus. I understand that MIPs may be a good option to consider towards this goal. I am fine with some variability in the monthly income received. However- I understand that each of the payments would attract 28% tax (Dividend Distribution Tax). Doesn’t this make it an inefficient investment option? Kindly let me know your thoughts on this. Also- can you give me 2-3 options to consider towards this goal? Yes DDT has been increased to 28%, is surely a dampening factor for those who would like to receive periodic payments from MIPs. For individuals who are in 10 or 20% IT slabs, MIP-Div may not be that useful. For those who are in 30%, these are slightly better. I believe MIP-Growth option can be a better option to invest a portion of surplus money for say 2 to 3 years. The remaining balance surplus amount can be invested in FDs as they pay regular and guaranteed interest payments. You may also consider investing in a ‘Debt fund’ (growth option) and have a SWP (systematic withdrawal plan) from it. Read : Best Debt Mutual Funds. I am retired person and i would like to invest about 1 lac each in Mutual fund so as to get a monthly income. I have invested in a Mutual fund mainly equity for small sums a maximum of Rs.10,000/- at one go and have never benefited much so much so that i closed it after a year or so. Now as the Bank FDs interest have come down the financial consultant have recommended the above but just now i read your article so could you please help me with some recommendations. If your objective is to get monthly or periodic income then do not invest in any of these funds. Do you need ‘fixed monthly income’ or even irregular payments are also ok? Equity funds give you good returns if you remain invested for longer period. Yes, again it depends on which schemes have you invested in?? I want to invest in monthly income funds from where i can get 75 to 85 K per month guaranteed ,please advise which is the best fund in this requirement . May I know the reason for this? Kindly note that MIPs do not offer guaranteed income. Currently I have 10 lakhs in FD ‘s. Since the interest rate are so low, should I go for MIP. I am looking to get a regular monthly income. Also can I invest a part of the interest into other growth funds. I am keen on investing in pharma sector funds. Can you please suggest me. MIPs can be a better alternative but you may not get assured periodic payments. So, a portion of your FD money can be invested in an aggressive MIP fund. Why do you want to invest in Pharma funds? 1. I can invest 2000 to 3000 per month for about 8-10 years. 2. I want the least possible risk. 3. I know as the risk is low so even return will be low but here request to suggest the best MF category in which I should invest to get good return. Provide your feedback and suggestion on it. Also with category let me know the particular MF in which I should invest with monthly investment in each MF under SIP. To get GOOD returns you got to take risk. Kindly note that mutual fund investments are subject to various risks. You can consider investing in a Balanced fund. I believe that this fund category can suit to you. Remain invested for atleast > 5 years . I am new to this Mutual Fund, i am willing to invest 6000 to 9000 per month in MF. Could you pls suggest me which kind of Investment is safer and give reasonable good returns. I heard that there are many schemes like Large Cap, Small and Mid Cap, Balanced, etc. I am not aware of these things. I am a 35 years old salaried person. Married and have one Female child. I need your suggestions in MF investment. Kindly let me know your investment time-frame (horizon)?? and financial goals. Can u suggest a fund name, with highest dividend payout regularly, monthly, quaterly etc. and as Division tax is deducted at source Is a good idea? Does this eat into my Returns? Kinday suggestion another parallel scheme for fixed monthly returns. Why do you want to invest in Dividend option of MFs? Let me know your financial goals and investment time frame?? MIPs (dividend option) are good for periodic returns if you have investment horizon of say 2 to 3 years. But do note that periodic payments are not guaranteed. I request your guidance in investing in mutual funds. since am a new comer here, i dont no much about the mutual funds however i have collected from information for my investment. Is both of the plans looks good . if not please guide me . For such a short-term horizon , do not invest in ELSS or equity funds. Can you please let me know the other options . What is your investment time-frame? Do you have sufficient health cover? Did accumulate your Retirement corpus? I have shares worth 70 Lakhs at current market value . Because I’m clueless about shares and MF . The fund has been idle . I want to invest so that I get a lump sum monthly income or at least quarterly . Since you have mentioned monthly income is not gaurenteed . I’m open to 1- 3 year plans . Pls advice . If you have clueless about shares, how come did you accumulate Rs 70Lakh worth of shares? I inherited those shares , and I did check the share value . That’s when I realised . Kindly provide more details..what is your age? Do you have any financial commitments? What are your financial goal(s)? Do you have any family member(s) who are dependent on you? I’m 30 yrs old , married . I’m looking to get some extra income . So that me and my wife can use to meet our extra expenses . As of now I don’t have any financial commitment . I have a family business which are running ok . So please give me advice what to do with the share . I know there’s option of FD . But the interest rates have drastically come down . So I’m looking for some other option . Monthly or quarterly . Considering your profile, you can invest in Monthly income plans (opt for dividend option). Also, suggest you to invest a portion of the money in Balanced fund for long-term wealth accumulation. Can you suggest any good current MIP or balance fund ? Because am not familiar with these terms or there benefits. You may consider – Birla Sunlife MIp II welath 25 plan & HDFC Balanced fund/TATA Balanced fund. I spoke to one financial consultant. He said NoBody is recomending MIPS , because of some tax issues . It seems you have to put for 3 yrs in MIP to get tax benefits . Is this true ? Selection of financial products should be dependent on financial goals and investment objectives. Always think beyond taxes when investing! MIPs do not have any tax benefits. Dear Srikant,On 31st july in answer to one query,you have replied that NAV is calculated after adjusting for all kinds of expenses.Kindly clarify,does it mean that NAV (as shown in your blog)is post deduction of expense ratio and exit load?kindly reply. Dear Mr Bansal..yes, that is why it referred to as NET ASSET VALUE. I am 37 years old and doing advocate by profession and blessed with 1 Male aged about 7 years and 1 female child aged about 1 year. I am now investing Rs.10000 SIP in ICICI Prudential Tax Plan-4000 (from 5 years), ICICI Pru Child Care-Gift Rs.1000 ( From 5 years), Motilal Oswal Most Focussed Long Term Fund-Rs.2000 ( From 8 Months) and Birla 95 Fund – Rs.3000 ( From 3 Months). I am planning to take retirement at the age of 50 years ( 13 years balance), in this view i am planning to Invest Lump sum Amount of Rs.30Lakhs. Plz advise how much i will get returns at my age 50 years to overcome smooth life..
We can not expect the exact returns from mutual funds. But we can get decent inflation adjusted returns over a long-term. Suggest you to go through my article : Retirement planing goal and calculate the required amount of savings. I want to invest about 15 lakh in MIP. I want to know what is my monthly income. I want to invest for long term. I also want to know that when I close this investment what amount I will get of 15 lakh. Kindly note that MIPs do not guarantee any periodic income. If you want to invest for long-term, consider Equity oriented schemes. I did not understand your query dear Naveen. Kindly rephrase it..
Sreekanth, in your article you have shown % returns in the tables. Have you shown the returns after DDT is taken out? Else the real return will be 72% of what you are depicting in the tables (in Returns columns). Please clarify. The returns are based on the NAVs for specific periods. NAV is calculated after adjusting for all kinds of expenses. That is why it is known as NET Asset Value. i have a bank account in HDFC so have a demat account as well. can i invest in mutual funds with the help of current demat account? if yes, kindly educate how to start? if no, kindly advise the necessery steps. You can use your Dmat account to invest in Mutual funds. Suggest you to first identify your financial goals and time-frame, based on them select right financial products (mutual funds etc) and invest. Let me know your financial goal(s). I have 3 kids. i want to invest for their future, means education, marriage of daughter etc. my kids are 6 years 4 years and 1.5 yr old. i can invest 25000 PM. i have studied about the below given funds. kindly advise are these good enough to invest? On another comment (on Q&A) you have mentioned that you have 2 kids?? sorry, typo error. i have 3 kids. 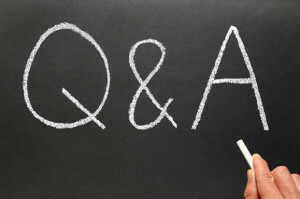 I have suggested you to go through few articles as reply to one of your comments in Q & A section. Kindly read them and revert to me. Also, it is not advisable to invest in so many funds. Kindly read my article : Top Equity funds and you may select few best picks from the list. hello sir , I never invested anywhere except bank FD and post office . I want to invest in MIP for 1 year. how much profit can i gain in MIP. which MIP is good. should I invest a lump sum amount . my lump sum amount is rs. 10000.what is exit load. It is almost impossible to get high profits with low risk. Since your investment horizon is 10 years, suggest you to invest in a balanced fund and one diversified equity fund. Ex – HDFC balanced fund & Franklin Prima Plus fund. Thank you very much sir. U plzz tell me that to whome i meet for investment. Or where i have to go for invest. Some of my friends advised me to consult “carvy consultancy” is this true.. I am frm nizamabad telangana state. Yes, you can also approach Karvy team. But invest in the funds you would like to and do get misled by any agent/advisor. I am new to the world of investing. your blog is very informative written in a very simple language which helps newcomers like me a lot. i) do elss funds and ppf investments fall in the same category of tax exemption (i.e 80C)??? ii) what is actually meant by “long term capital gains” and “short term capital gains”?? what is the time frame required for avoid tax from such income? 1 – Yes. The maximum tax deduction that you can claim under sectin 80c is Rs 1.5Lakh. 2 – Kindly read my article : Mutual Fund Taxation rules. Dear Sreekanth,In your list of best MIPs,the return given after one ,two and five years is including or excluding expense ratio and exit loads if redeemed after one year.Kindly reply. It is cumulative returns and do not include exit loads (but includes expense ratio as it is priced in NAV). Dear Srikant,Thanks for reply.I am in 10% slab,for that I am investing in ELSS funds suggested by you.How much money I may need to invest in short term funds as suggested by you to get Rs.2 lakh per year. What is the amount that you can contribute? Also, remember MF MIPs returns are not guaranteed like bank FDs. So, kindly understand the risks associated with MIPs before investing. i have seen ur blog. It is very informative sir i am retired govt servant. One of my FD of RS 5ooooo/- is maturing in this month. What is your investment horizon (time-frame)?? Kindly let me know your age and do you require fixed regular / monthly income? Dear Srikant,Last time I asked a Q on 22-06-15.For which you have asked me my financial goal.My short term financial goals are for one year,two years and three years.I need about 2 lakhs every year for EMIs for next three years.Kindly suggest me best plans. For 2-3 year goals, consider MIP aggressive or conservative plans. Read my article on Top MIP funds. For 1 year goal, I believe that FD would be a better choice. What is your income tax slab rate? Dear Srikant,MIP plans and ELSS funds,which one is better.Both are locked for three years.kindly reply. Kindly note that MIPs do not have any lock-in period. Let me know your financial goal(s) and investment time-frame..
As you pointed out, instead of investing in an FD, I would like to invest in MIPs. I already am investing Rs 6,000 per month in SIP as discussed with you earlier. (1) If I am investing Rs 10,000 lumpsum in Birla Sunlife MIP II Wealth 25 Plan this year, how much time should I hold the investment to avoid the Exit Load of 1%? (2) What is preferred option – Growth or Dividend? (3) Is STCG/ LTCG attracted on the same and if yes, at what rate? What will be the post tax return? Because MF are generally exempt from any taxes. Just wanted to know how will I have to reflect the same in ITR. (4) From tax-angle saving perspective, should investment be done in ELSS Funds or any other options like MIP as well. 1 – Exit load of 1% is charged if units are redeemed before three years from the date of purchase. 2 – If you want regular payments,opt for dividend option. 3 – MIPs are considered as Debt-oriented schemes. Read my article : MF taxation rules. 4 – ELSS are the only tax savers (u/s 80c) available within MFs (Retirement funds are also eligible for deductions but I suggest you to stick with ELSS funds). Sreekanth Really simple and informative, keep up the good work.. I have already provided the top ones in the article, you may choose any one of them. You need to opt for “Dividend” (income) option to receive the payments. But do note that you may or may not get regular income from MIPs. Thanks for providing such nice info. on Mutual funds and investment. This is really helping a lot of newbies like me. Can you plz suggest the portfolio funding as per my below needs/requirement. I am 27 Yr. old, I already have a term plan(LIC), a ULIP(ICICI) , Endowment from LIC’s(waste ..:( ) and one Axis LT Mutual Fund. I will really needing money in next 3.5 to 4 years(15-20 lakhs). Can you plz suggest which portfolio/funds should i go. I can’t take much risk as that money after 4 years is needed in any case(so, it should atleast give 10% ROI), but in parallel i want to get the optimize results/interest. I can invest upto 30K -35K per month. I dont’t want to have tax savers as i some howcovered the same by previous investments. Plz suggest the optimum portfolio/funds. Suggest you to check out Mutual Fund monthly income plans (growth option). First of all , I sincerely want to thank you for this blog as it has vastly improved my knowledge regarding investments and tax saving. I am 25 years old and I have 20k per month to save/invest. I want to save 1.5 lakhs this year for Tax saving purposes and rest I want to invest for different time horizons. My risk appetite is moderate. For tax saving , I want to have a term plan, PPF and ELSS. Please tell me how much percent of balance should I invest in PPF and how much in ELSS from what is left from term plan premium. Kindly calculate the approx premium amount on your Term insurance policy (which you are planning to take) and then let’s decide on the remaining portion. Are you a salaried person? Do you contribute to EPF? Yes I am salaried but I do not have any EPF contribution. Buy a Term plan at the earliest. PPF & ELSS funds are fine. I wont be needing money necessarily but it will be good to have some corpus as I will be marrying after 3 years. I just want to invest my extra money which will be sitting idle in my savings account yielding negative returns. That’s why i want a diversified portfolio to make the most of this 8000. Birla Sun life MIP II Wealth 25 plan. Hi Sreekanth , thanks for your advice. For short term , I will park my money in liquid fund. Except for the sector fund, the selection and allocation is fine. Thanks a lot Sreekanth. I will limit my amount to minimum in high risk sector fund. I am new to mutual funds, I am 25 yrs old and want to start saving 1000 each on few mutual funds (total 5k per month) I prefer minimum lock in period and will invest for 5 years term. My objective is savings and get good returns. Minimum lock in so that i can withdraw anytime. Can you guide me which funds should I invest? Except ELSS Funds , all other equity oriented funds have no minimum lock-in period. You can redeem the units anytime. ELSS funds have 3 year lock-in.